Happy New Year! I cannot believe that 2012 has already come to an end. We have had a fabulous year and I cannot wait to see what 2013 holds for our family and for this blog. I know I have been an absent blogger these last few weeks and I hope you understand that I have been spending some time "unplugged" with family and friends and relaxing during the holidays. I promise to be back in full swing in the next week with tons of fun new recipes, money saving tips and couponing trips. I have big plans for Couponing & Cooking in 2013 and I can't wait to share them with you all! 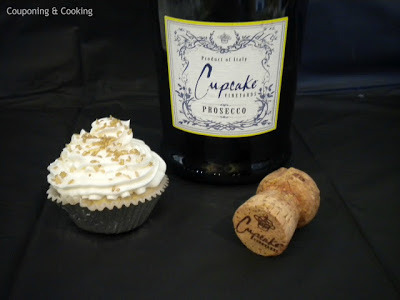 Since there was no link party last week I have no features for you today but I thought that I would share my Champagne Cupcakes just in case you were looking for a fun New Year's Eve treat! Since it is almost New Year's Eve, I invite you to not only link up what you have been cooking this week but also your favorite recipe posts of 2012. Link up as many as you please! The more the merrier! Happy 2013 and know that I am so thankful for each and everyone of you and what you bring to my blogging experience. I hope that you and your family have a healthy and happy new year! On to the party! Thank you for hosting!! I am loving these parties that are offering the opportunity to link up our favorite posts of 2012. Thanks for hosting, Kaylee! Have a great New Year! Thanks for hosting:) Just had to drop back in to add another! Kaylee, I remember your champagne cupcakes. They are definitely one of the standout desserts for 2012. Happy New Year. Happy New Year from the ladies over at Who Needs A Cape?.